Before I went vegetarian almost 10 years ago, I used to love chicken alfredo with broccoli and fettucine. I actually haven’t thought about it for years and most of the time I’m not a big fan of vegan meat alternatives. 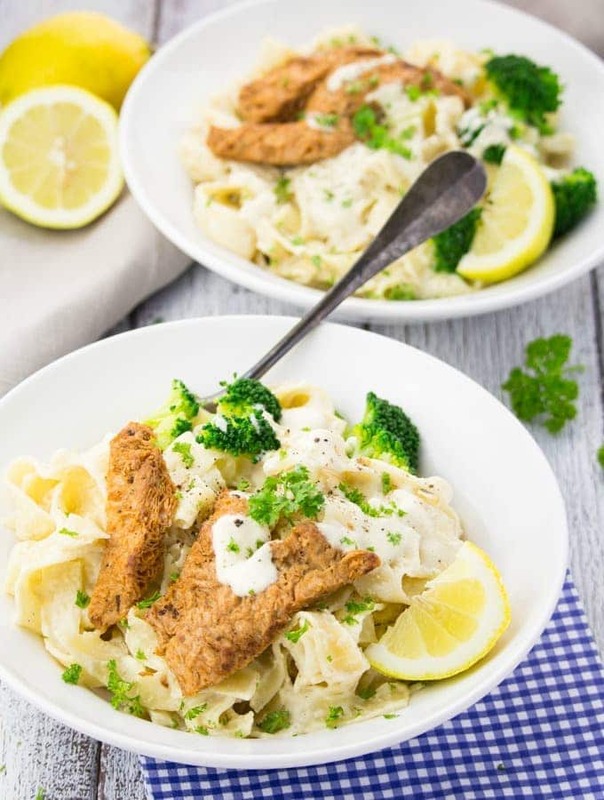 When I realized that the textured soy chunks (also called TVP) I bought last year would expire soon I just knew now was the time for vegan chicken alfredo and surprisingly I really loved it!! I’ve made vegan fettucine alfredo many times before, but this was the first time I added vegan “chicken” and it was so damn delicious!! 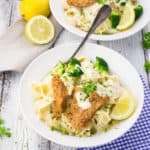 So what is TVP and how do I use it to make this vegan chicken Alfredo? TVP is short for textured vegetable protein and as the name suggest it’s made from vegetable protein, most commonly from soybeans. It’s very high in protein and is an awesome vegetarian and vegan meat substitute. Its protein content is actually far greater than that of meat, which is amazing! TVP is very easy to cook and comes in many different forms. You can either buy big chunks, shreds, or minced TVP. Minced TVP is great if you want to veganize recipes calling for ground beef or turkey such as tacos, Bolognese sauce, meatloaf, sloppy joes and many more. I usually cook the TVP for about 10 minutes in vegetable broth, but I’ve also heard that some people just put them in a bowl, pour boiling water over them, and let them sit for a while. Once they’re ready, let them cool down a bit and then use your hands and squeeze out as much water as you can. They’re kind of like little sponges. Textured vegetable protein was actually invented as early as in the 1960s and was often used by restaurants as a money saver. Since the 1970s it has also been added to school lunchs at public schools. It’s pretty cheap (usually about 3 to 4 dollars for one pack) and you can find it at any health food store or in the health food or bulk section of regular grocery stores. For this vegan chicken Alfredo I used medium-sized soy chunks, which I seasoned with soy sauce, liquid smoke, paprika powder, salt, and pepper. Heat some oil and pan-fry them for about 5 minutes or until crispy and brown. Check out this awesome post on how to prepare textured vegetable protein by wikihow for more info. For the vegan Alfredo sauce I used cashews, one onion, garlic, lemon juice, one small cooked potato, unsweetened almond milk, and a little bit of mustard. Just put all ingredients in a blender and process until smooth. The potato and the cashews make this sauce super rich and creamy! You would probably never guess that it’s completely dairy-free and doesn’t contain any oil or butter. 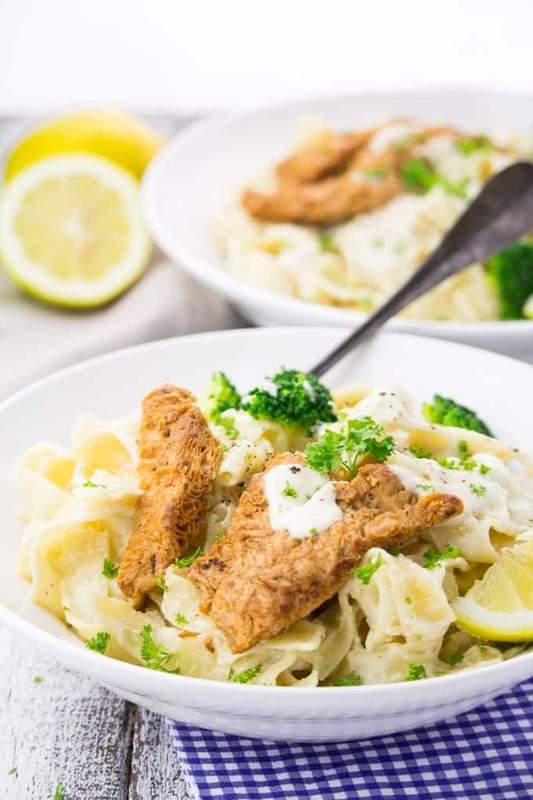 If you want the vegan fettuccine Alfredo to be soy-free just leave out the textured vegetable protein and use more broccoli instead. The rest of the recipe doesn’t contain any soy. 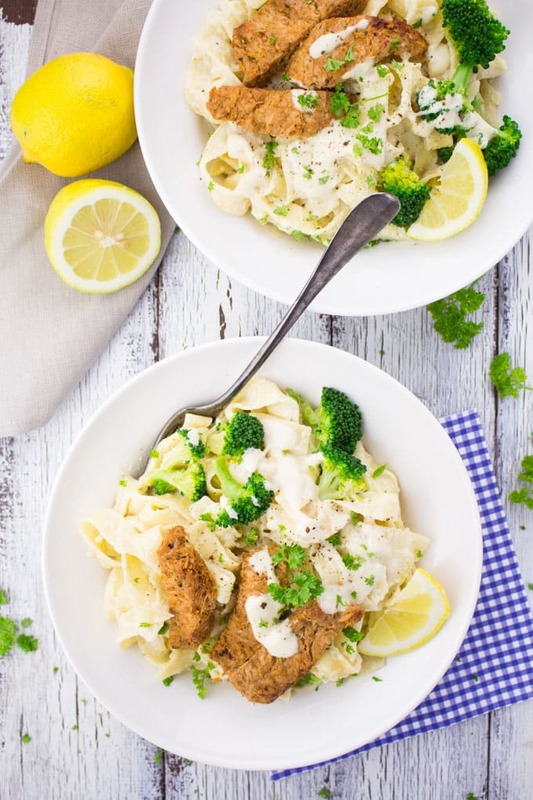 Let me know if you give this vegan chicken Alfredo a try! As always, I love to hear from you guys and see your Vegan Heaven creations on Instagram (don’t forget to tag me with @_veganheaven_). Cook the TVP for about 10 minutes in vegetable broth on very low heat. Once they're ready, let them cool down a bit and then use your hands and squeeze out as much water as you can. They're kind of like little sponges. Set aside. Cook the fettuccine according to the instructions on the package. Cook the broccoli for about 3-4 minutes. Then make the vegan Alfredo sauce: Heat some oil in a large pan (you'll need this one later on to combine the sauce and the pasta) and sauté the onion and the garlic for about 3 minutes. Put in a blender with the rest of the ingredients and process until smooth. Heat one tablespoon of canola oil in a frypan and add the soy stripes. Season with soy sauce, liquid smoke, paprika powder, onion and garlic powder, salt, and black pepper and pan-fry for about 5 minutes or until crispy and golden. 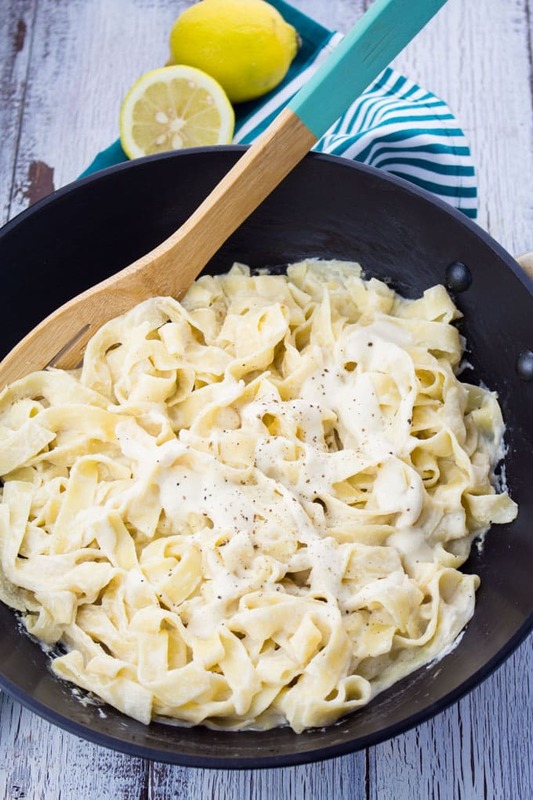 Put the vegan alfredo sauce in a large pan and cook for a minute until it becomes creamy and thick. Add the pasta, the broccoli and the vegan "chicken". Sprinkle with fresh parsley and black pepper and serve with lemon slices. Love vegan alfredo! I actually like it more than the non vegan variety. I make it all the time and the family loves it! Especially with broccoli. Yum! Looks delicious Sina! This looks so deliciously decadent. And I love that you made the chicken yourself from scratch! 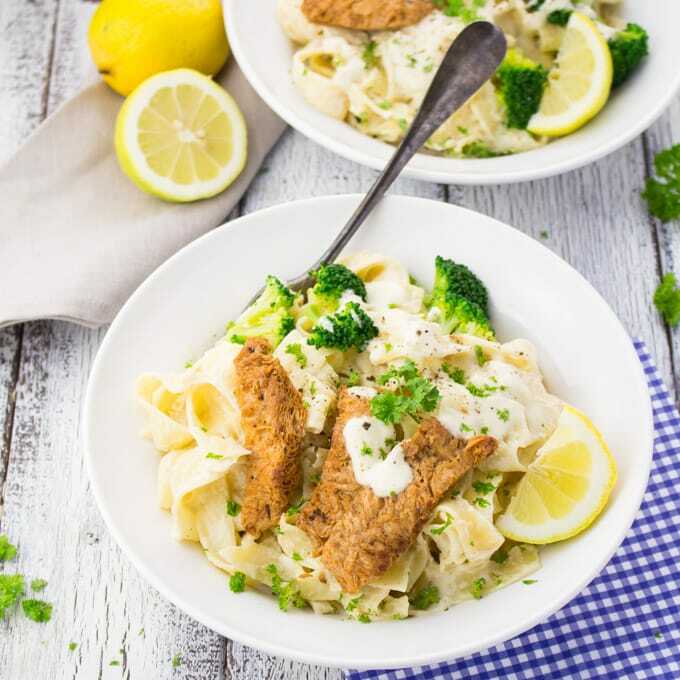 I’m with Sophia – I never liked regular alfredo sauce, but I’ve tried several vegan ones and I love them! This dish looks so yummy! I don’t use TVP very often, but I think I do have some in my pantry that probably needs to be used up! Ooh, I love cashew alfredo – so creamy! I’ve never experimented with TVP, but that “chicken” looks pretty darn delicious. I’ve never used TVP before, but obviously I’m missing out because this looks amazing! Yum! Looks SO delicious!! I’ll have to give this a try! Do you soak your cashews for this recipe and the Roasted Red Pepper pasta? I’m new to vegan cooking and so far the recipes I’ve seen with cashews had me soak them so they aren’t hard. Thanks for the info! This was AMAZING!! So incredibly creamy. Was a bit skeptical with the potato, but it really worked! Thanks for the recipe.